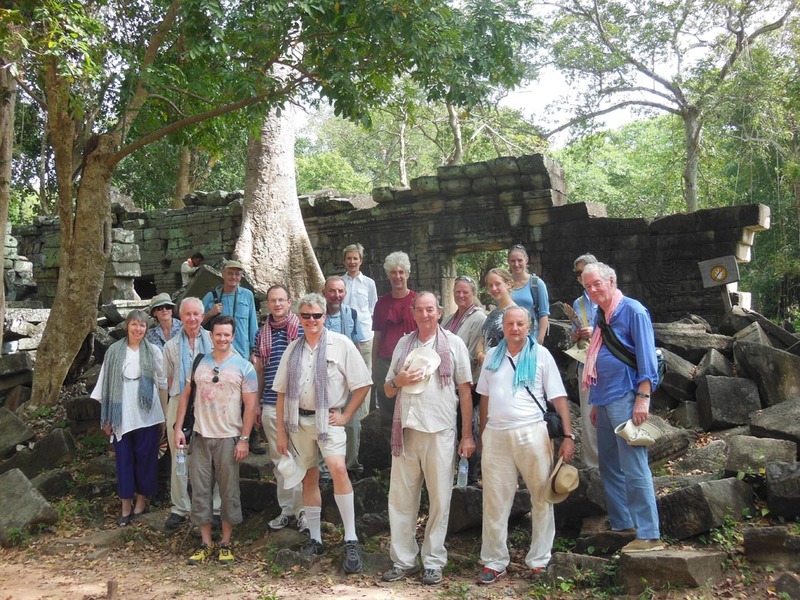 I am on the Global Heritage Fund UK trip to Cambodia this week to see our project at Banteay Chhmar. Led by our Senior Director John Sanday, OBE. 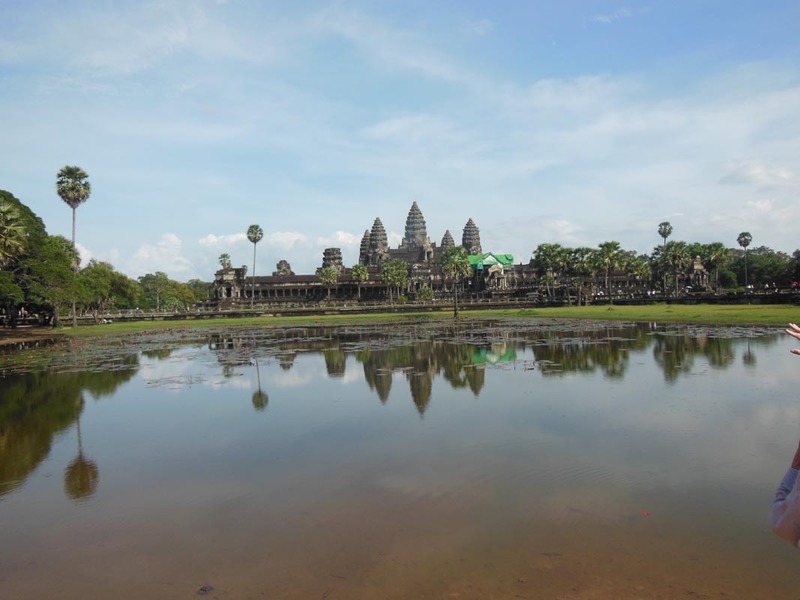 We began the trip with a visit to Angkor, including the famous Angkor Wat. An image of Angkor Wat is the center of the Cambodian flag, and as our compatriot John Pike noted, Cambodia is the only country in the world with an image of a heritage site on its flag. 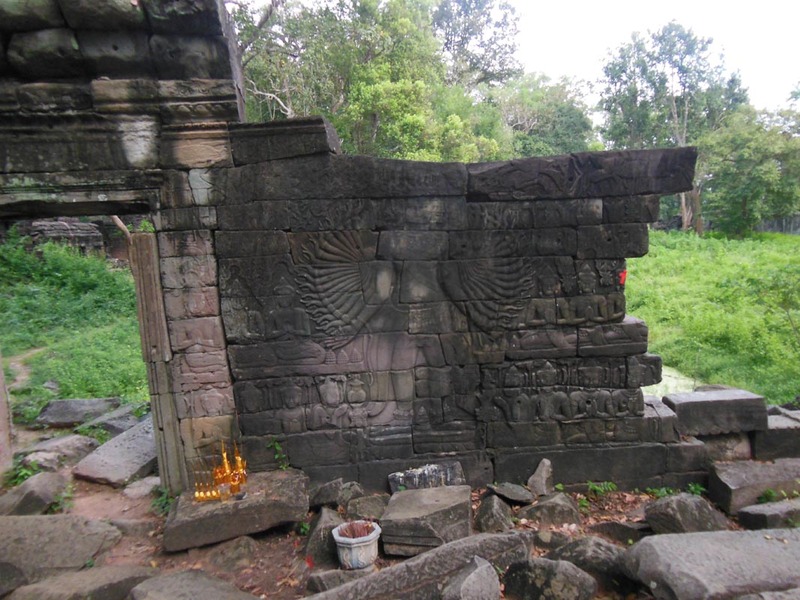 You could argue that the very existence of the country is based on heritage – the Khmer empires of the 9th through 14th centuries were centered at Angkor, and the sheer quantity of intricately planned and carved stone monuments here made it impossible to overlook despite its weakened state. Likely it would have been divided up by Thailand and Vietnam, but it became a valuable buffer between French Indochina and the Thai kingdom, itself surviving without colonization due to its position between the French and English. 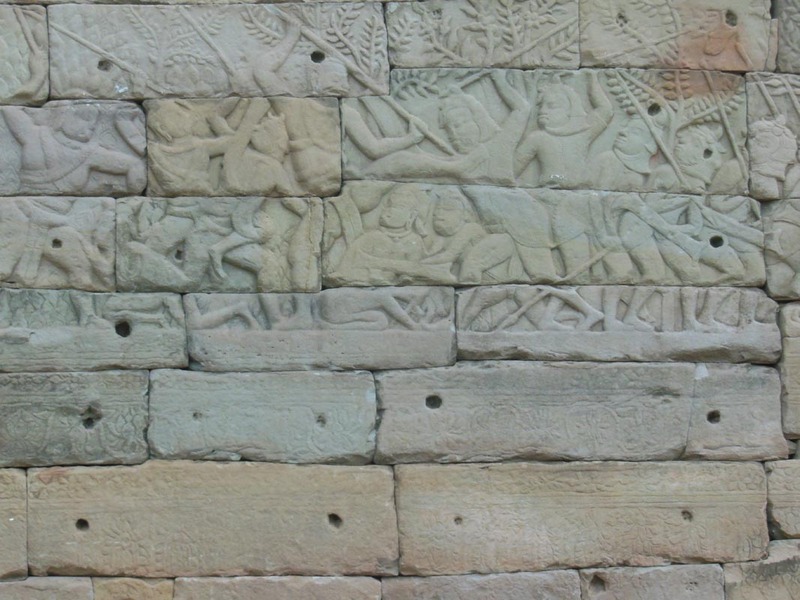 The Khmer enemy state of Champa disappeared from the map, and while the Khmer themselves became much less relevant with the rise of sea trade in the 14th and 15th centuries, their former empire left monuments impressive enough that France made the onetime kingdom a protectorate. 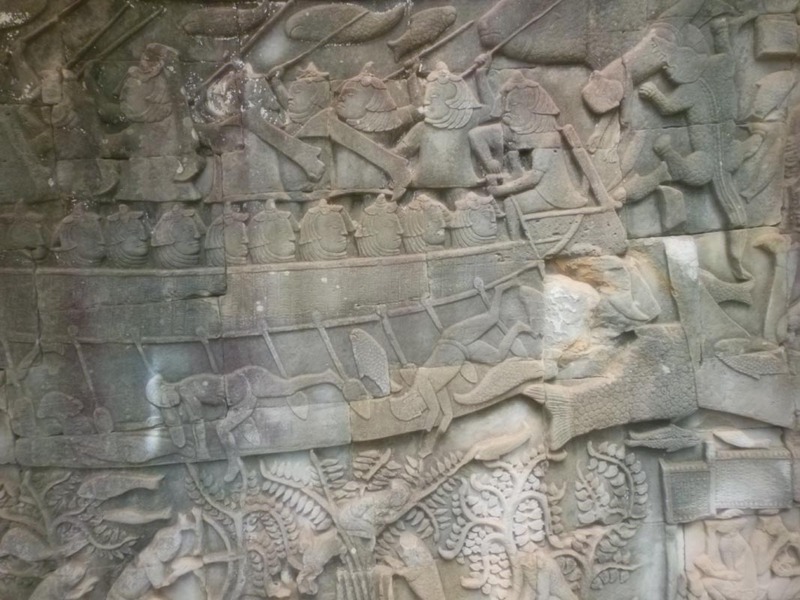 A Cham ship from the battle scene at Banteay Chhmar. In addition to Angkor Wat itself, one of the great attractions at Angkor is of course the Bayon, built by the Buddhist king Jayavarman VII in the 14th century and featuring two famous elements: First, massive face towers with the distinctly Khmer faces of Buddhas (probably) known for their artistic sense of peace and repose, sometimes called portraits of the great king Jayavarman VII himself; and a rich series of bas-reliefs depicting both battles with the Cham and scenes of daily life. 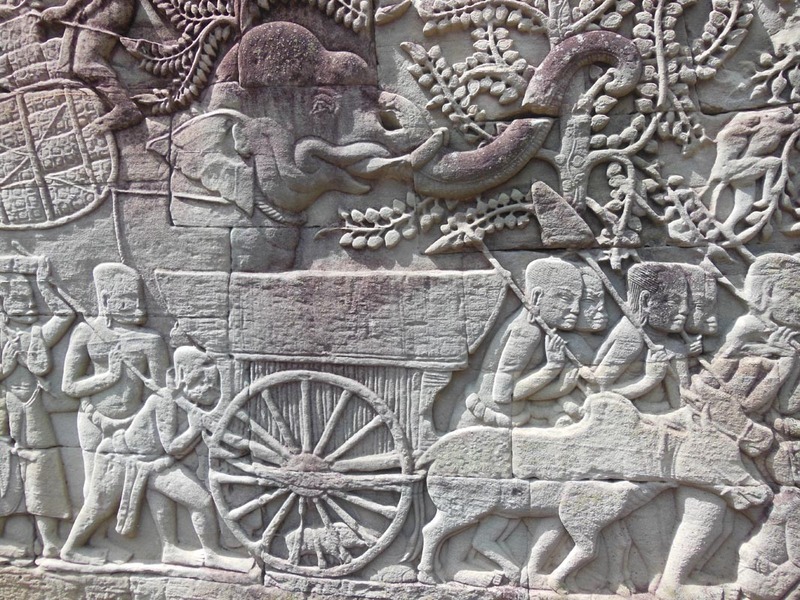 Both represent a high point in Khmer art and architecture, distinguished both by their Buddhist iconography (the earlier Angkor monuments are Hindu) and their rich layered realism. 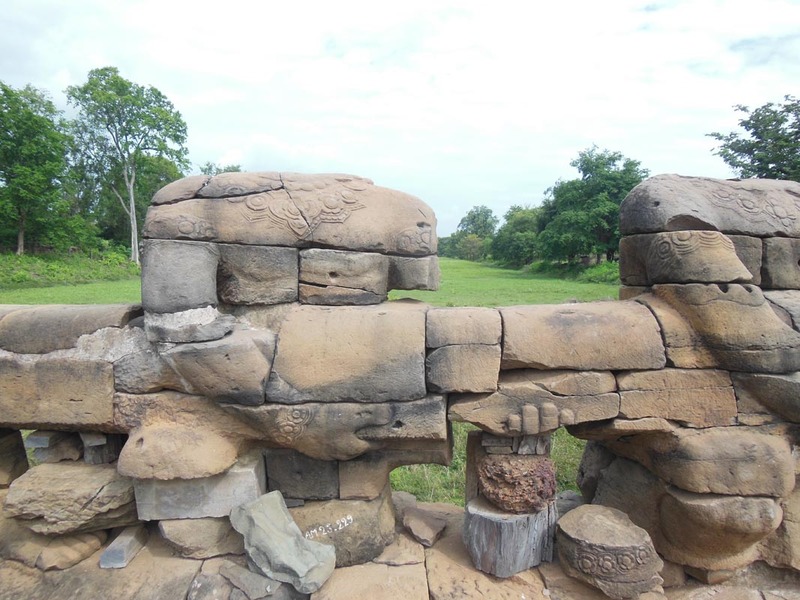 But both also exist at a site over a hundred kilometers to the northwest hard on the Thai border, where Jayavarman built a similarly massive temple called Banteay Chhmar, with over three dozen face towers and a marvelous series of bas-reliefs. The site is largely a ruin, although sections survived, and six years ago it became a flagship project for the Global Heritage Fund. We have two major projects there finishing up this year, both led by John Sanday. First is a section of bas-relief wall that has been carefully put back together. 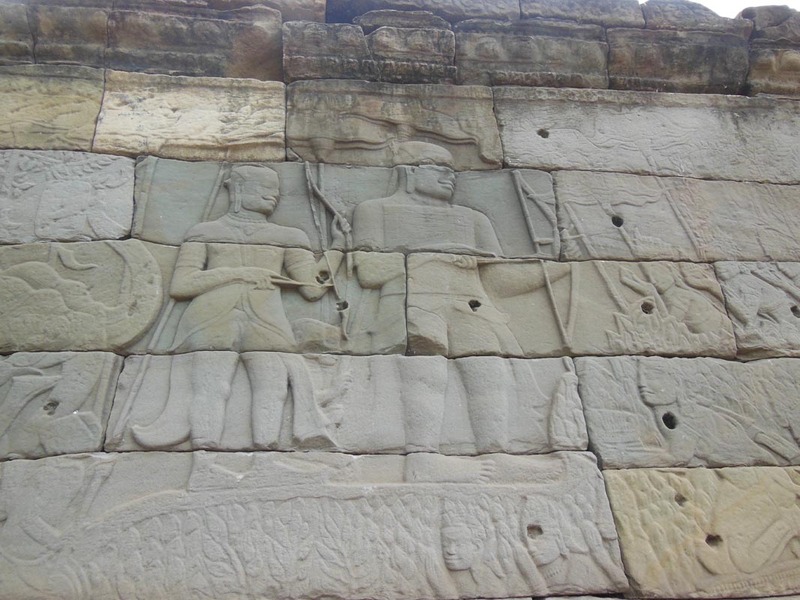 Like the bas-reliefs at the Bayon, it depicts Jayavarman VII’s battles, and it also depicts the king himself. 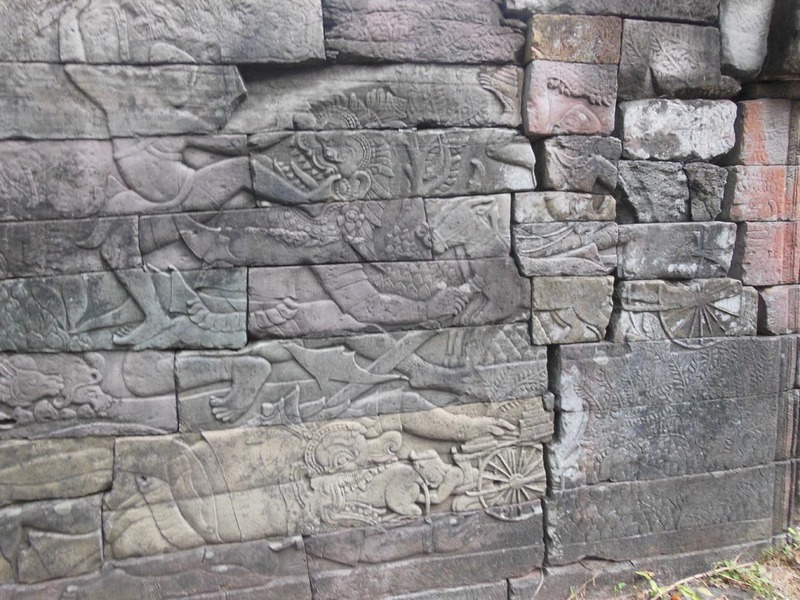 The relief is vertically bisected at a couple points by rivers with fish, and I felt as if I were reading an account of the battles where the Khmer met the Cham at various rivers. The reconstruction is proceeding nicely due to a new crane we received thanks to Chris Brewer. 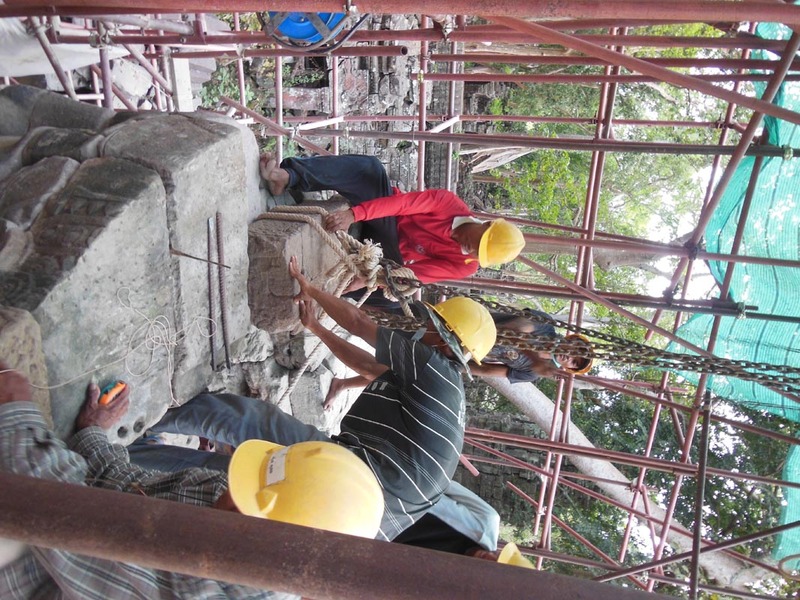 The value of the project goes beyond the reconstruction which makes this part of the ruined temple sensible. 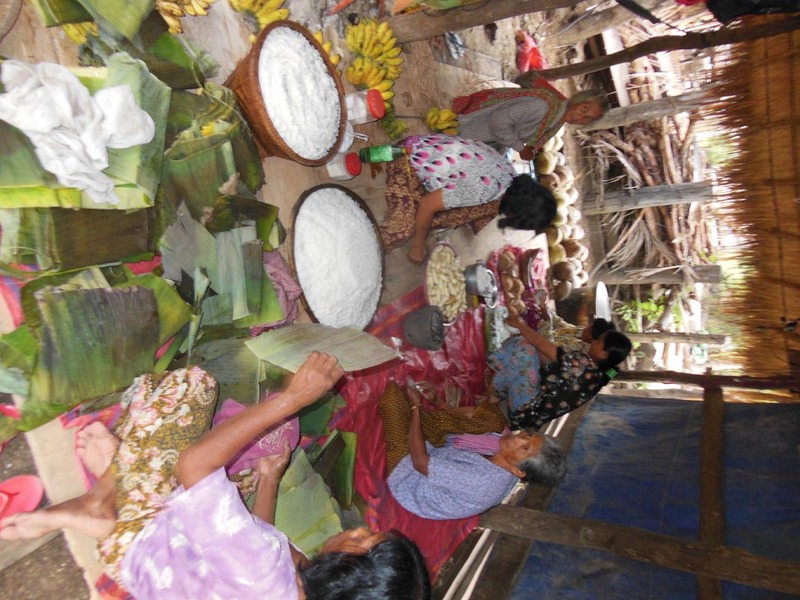 Much of the value lies in the GHF model which emphasizes community development and poverty alleviation. 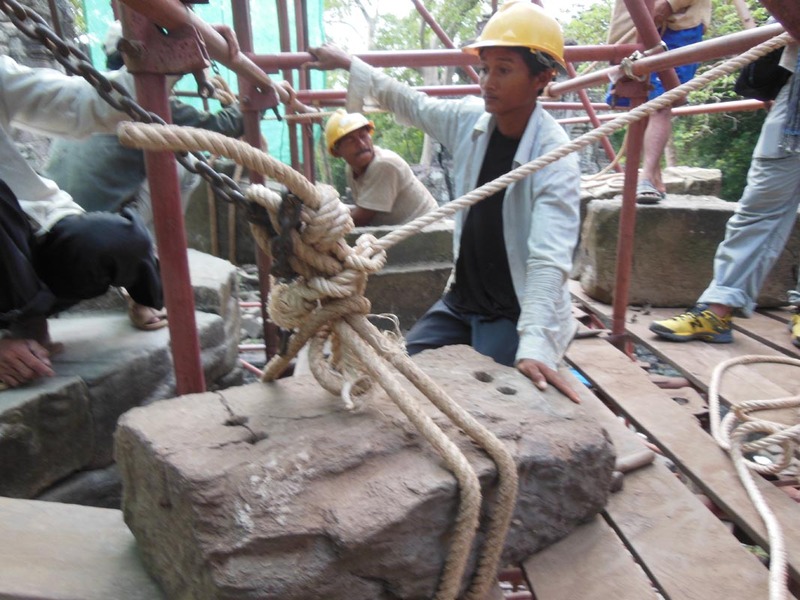 Almost 50 local workers have been trained as stonemasons and continue to work in teams at the site. They have new skills as well as a new appreciation for THEIR heritage. 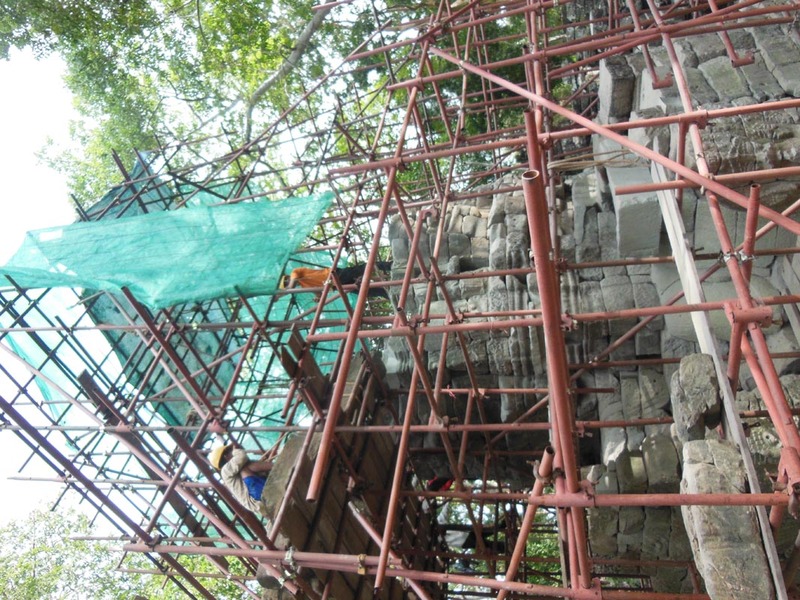 The second project slated to be completed this year is the reconstruction of Face Tower N 18. 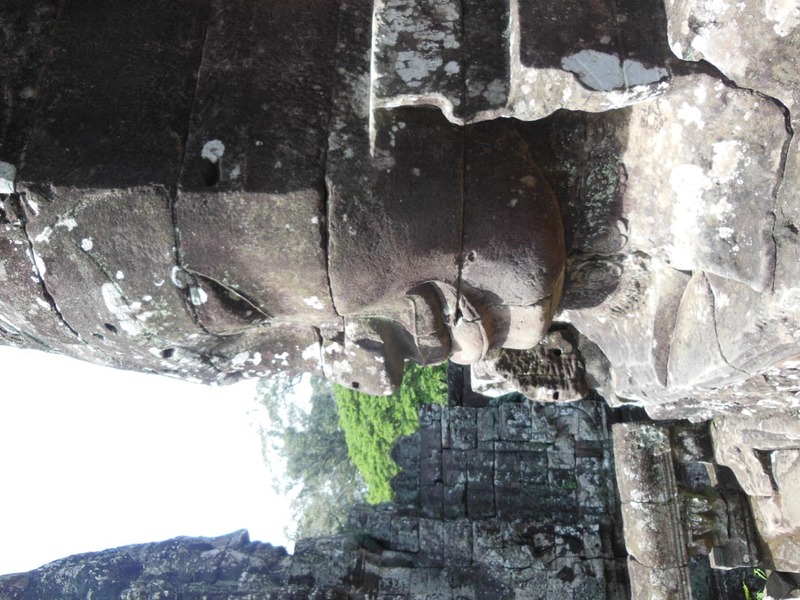 Like the Bayon, Banteay Chhmar had face towers – shikara spires that abandoned the traditional Hindu format of the repeated and redented aedicule for four massive faces with beatific Mona Lisa smiles. While some argue whether they are Brahma (who had four heads, so, yeah) or the Buddha (since Jayavarman VII was Buddhist and heavily promoted his piety) or even the King himself (you don’t get to be a king by being modest) the point is Banteay Chhmar is one of the most significant sites for these face towers, which came late in the art and iconography of the Khmer. 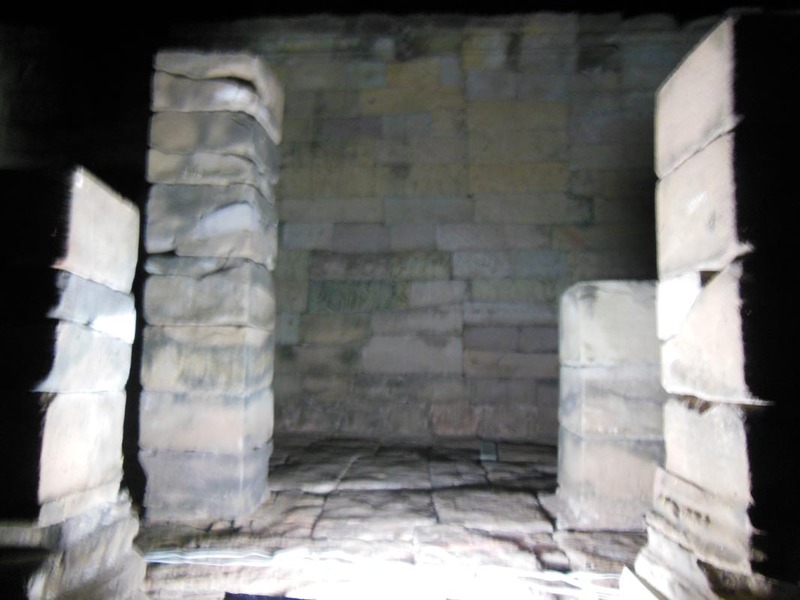 It even has several separate satellite temples that are face towers. 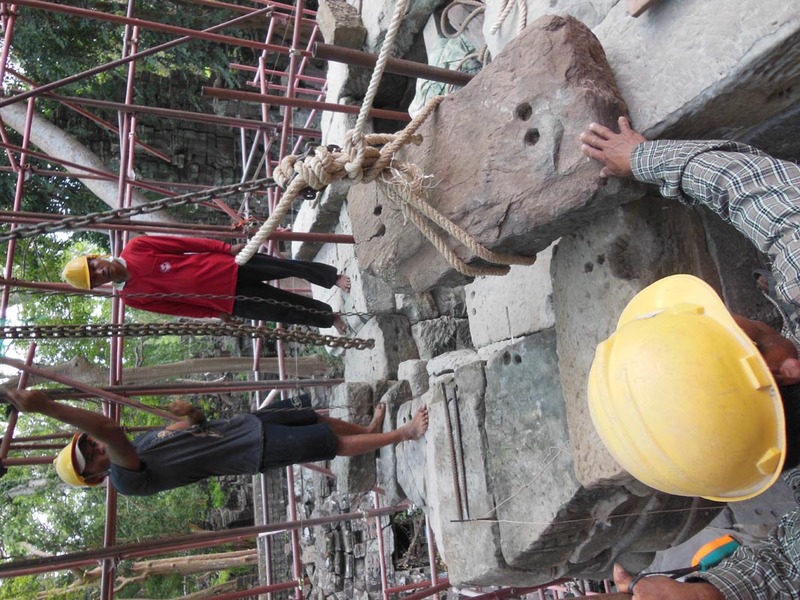 Ready to slide the stone via winch onto tower. Winching onto tower. 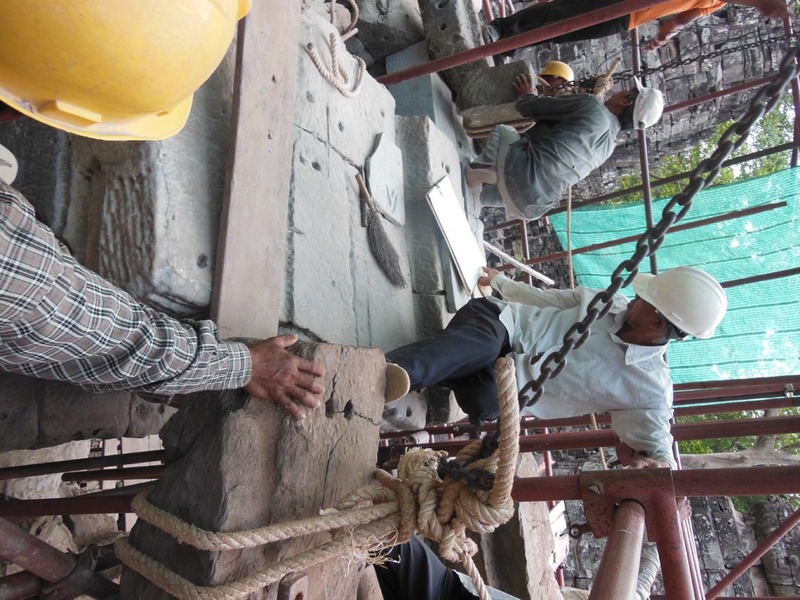 Note safety footwear…umm, er, nevermind. It was very exciting to see the work actually taking place, and to know that our support of heritage was supporting economic development for a rural town that previously had few options outside of agriculture. And looting. 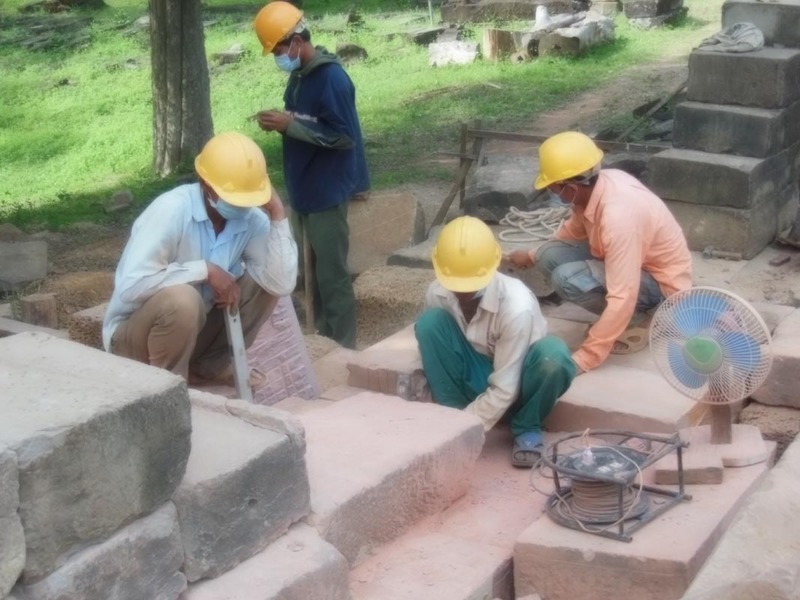 This is a key tipping point in any community with world heritage in its midst. We might appreciate it from outside, but the key – and the central mission of the Global Heritage Fund – is to conserve that heritage by empowering and enriching the local community. Then they have an investment in saving that heritage – and they are the ones who will save it in the long run. 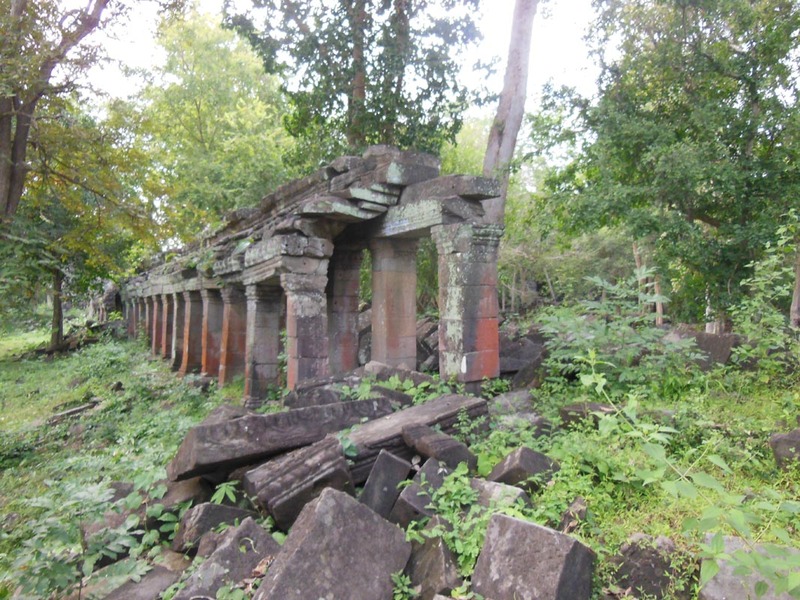 Being literally a stone’s throw from the Thai border, Banteay Chhmar was one of those sites that was looted. Another section of the bas-relief gallery that surrounds the temple is known for its unique images of the multi-armed Boddhisatva Avalokiteshvara, the Buddha of Compassion. Eight of these life-size figures survived into the 1960s, but two collapsed and then four were chiseled off in the 1990s and stolen. Two were recovered and can be seen in the National Museum in Phnom Penh. Two have been restored on site, and two more remain at large. 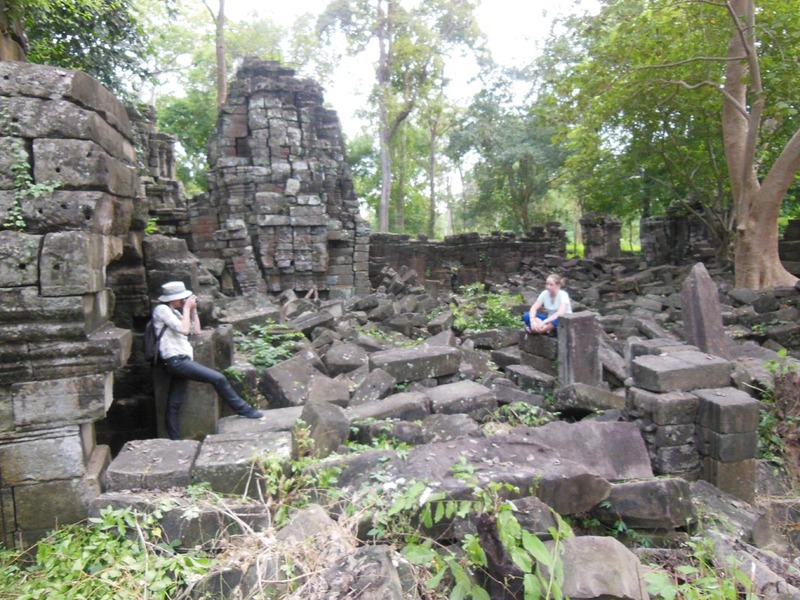 Everyone agreed that visiting this rambling, massive site gave a sense of wonder and discovery that was absent from crowded Angkor. 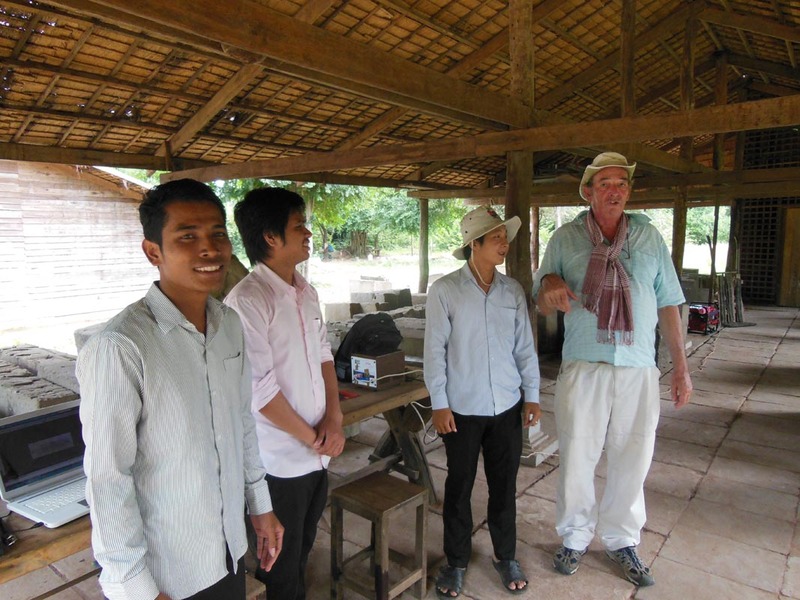 The next step is to implement the Heritage Vision which GHF Founder Jeff Morgan has supported through GHF. 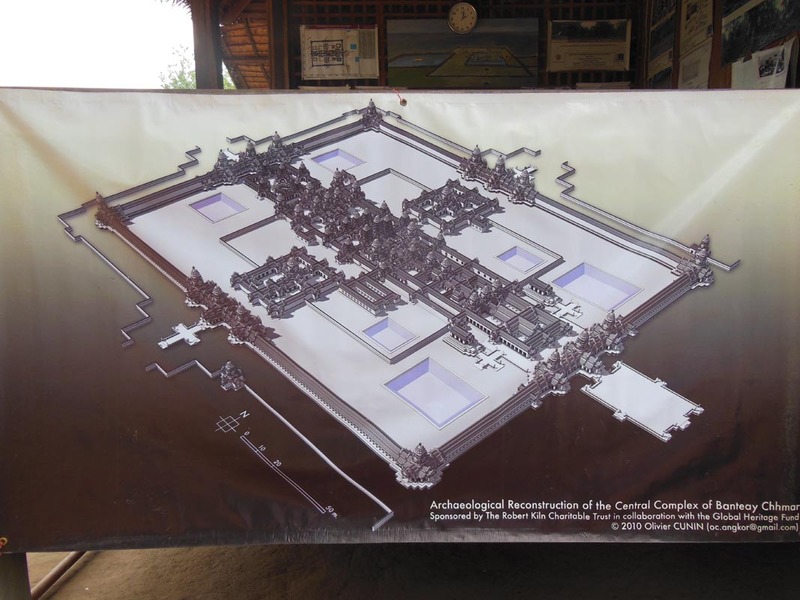 This vision imagines how the site can be restored and activated for the benefit of the community. Skywalks will allow visitors to safely walk above and around the toppled sections of some 48 shikara towers. The surviving sections of bas-relief can be visited, along with the restored section. The moat might be restored so you can pass the asuras and devas churning the Sea of Milk with the naga. Satellite face towers can be toured, and then a community area with restaurants and shops engendered. You can spend the night in traditional homestays, as we did. the restored bas-relief wall during evening music and cocktails at the site. Also crickets. 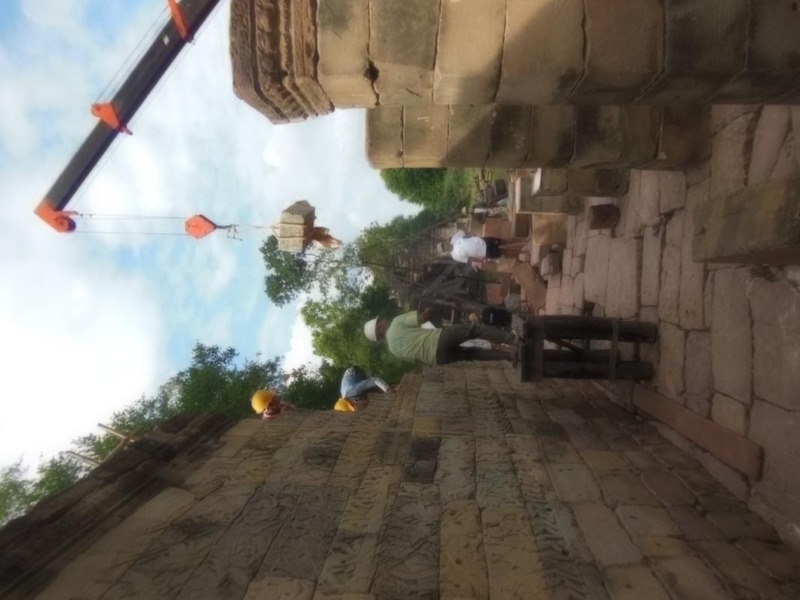 We had a great discussion about how much you restore: the virtue of the two projects Global Heritage Fund has completed is that they allow you to see what key elements of the temple looked like originally. Then you can imagine the rest as you clamber above and along the ruins: this is how the best interpretation works, buy giving a role to the audience. By trusting people’s imaginations and cognitive abilities, rather than spelling it all out for them. It is a point I made 6 years ago at Tustan in the Ukraine and one I made again here: give people the tools and let them do the reconstruction in their minds – it engages them in a site in a deeper and more meaningful way. 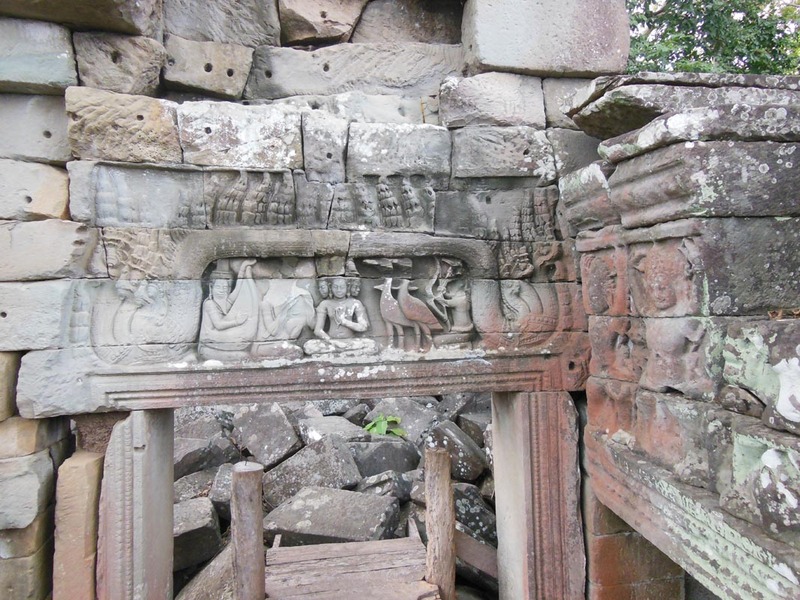 majestic and evocative face towers you see in the Bayon; the entrancing images of apsaras and the Buddhist iconography of Preah Khan, all in a remote jungle site far from the pressures of mass tourism at Angkor. 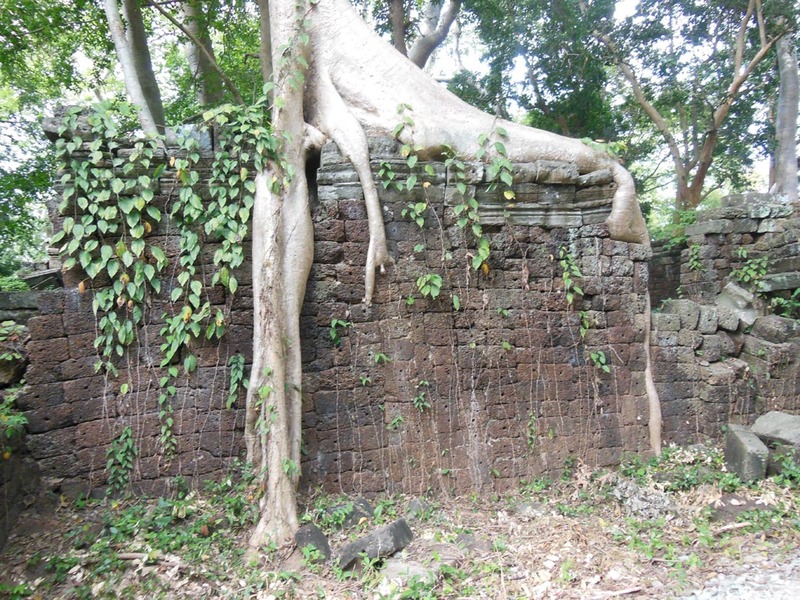 It will only be two and a half hours by road from Siem Reap near Angkor, but for now Banteay Chhmar lies over 3 hours by sometimes poor roads from the rest of the tourists in Cambodia. 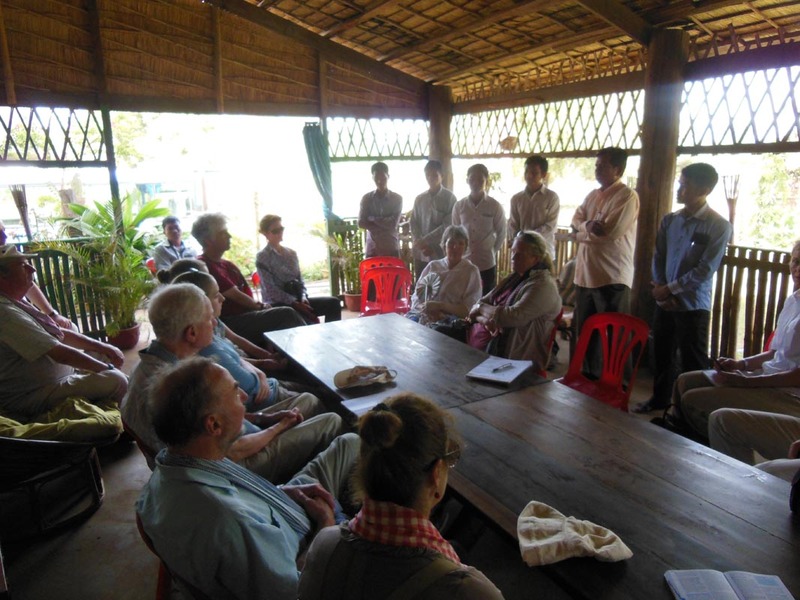 We met with the Community Based Tourism group that GHF set up, and they provide homestays and guide services for about 500 tourists a year. 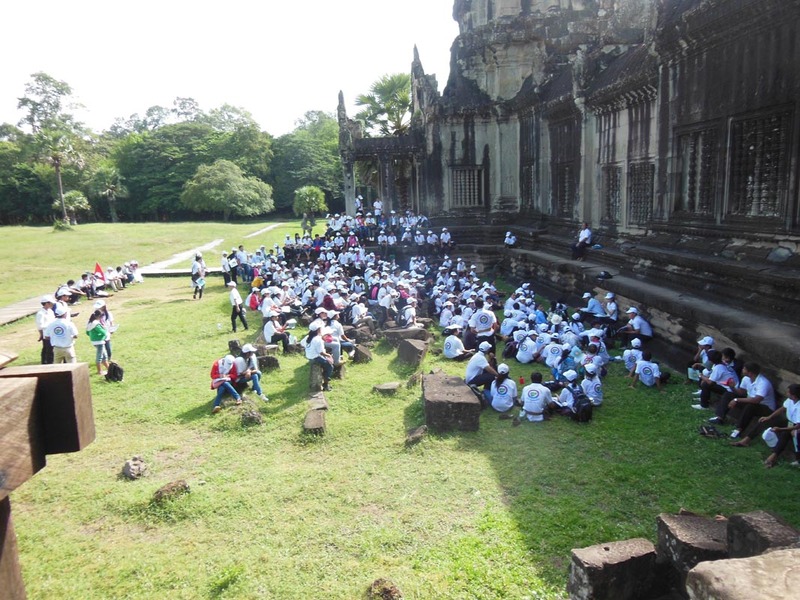 They could easily handle 10,000, still a miniscule fraction of those descending on Angkor. You are currently browsing the Time Tells blog archives for November, 2012.